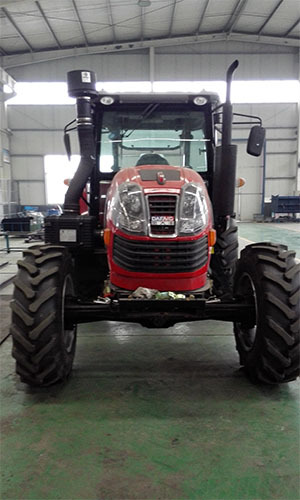 Product categories of 100hp Wheeled Tractor, we are specialized manufacturers from China, 100Hp Wheeled Tractor, Farm Wheeled Tractor suppliers/factory, wholesale high-quality products of 100Hp Agricultural Wheeled Tractor R & D and manufacturing, we have the perfect after-sales service and technical support. Look forward to your cooperation! 1. Domestic famous wheeled tractor diesel engine, strong power, low fuel consumption. 2. Double clutch, more reliable usage, adopting to different operating circumstances. 3. Advanced reliable gearbox has a reasonable velocity distribution, synchronized shift, convenient operation, and high work efficiency. 4. Adopting full hydraulic steering, Wheel Tractor reliable air brake system, which are very easy and simple to handle. 5. wheel tractor Wheel track is adjustable, which can meet the special needs of various regions. 6. Reliable front and rear axle design. 7. This series of products has suitable power, compact structure, high transmission efficiency, light weight, and simple maintenance. Its super performance could meet your requirements.